More about Fazer Chocolate Bar Sampler Pack Take your taste buds on a journey with this pack of three Fazer chocolate bars! With one milk chocolate, one dark chocolate and one peppermint chocolate bar, there is something for every one's taste (or all for yourself!) A favorite not only among Finns but chocolate lovers worldwide, Fazer chocolate is made from fresh milk and high quality cocoa beans to achieve its unique, creamy, soft and rich taste that makes it difficult to share. It makes a fabulous stocking stuffer around the holidays. Creamy smooth and delicious, you should get this! Can Chocolate be too good? A wonderful and underappreciated chocolate, Frazer should be tried by every lover of sweet things. You can pay much, much more, but you really can't buy better. 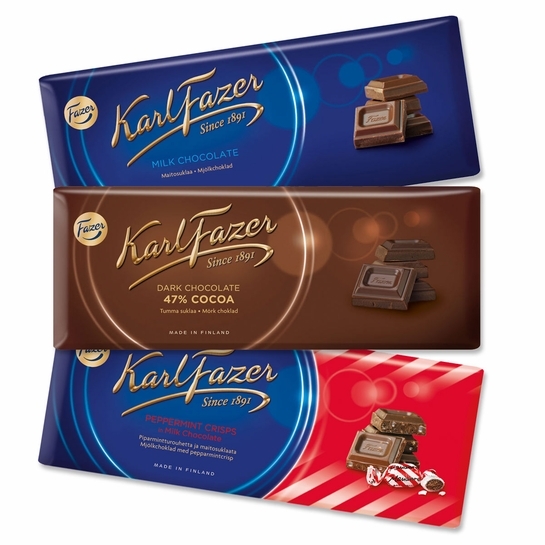 Three great Fazer chocolates at a savings! With different family members having different preferences in chocolate, this variety pack of milk chocolate, dark chocolate and peppermint chocolate is perfect! Together the price is less than buying each separately, so itâ€™s a great combination with savings. Fazer chocolate is the best chocolate in the world - so smooth, so good. These huge bars of chocolate are super creamy. My favorite is the dark chocolate, though the subtle flavor of the peppermint crisp is a close second. I ordered the chocolate sampler pack as I've never tasted Finnish chocolate. We had a taste of each one and they were all very good. My favorite was the dark chocolate ( the best I've ever had ) and my sister's favorite was the milk chocolate. The peppermint crunch reminded us of mint chocolate chip icecream in flavor. They were all very good!